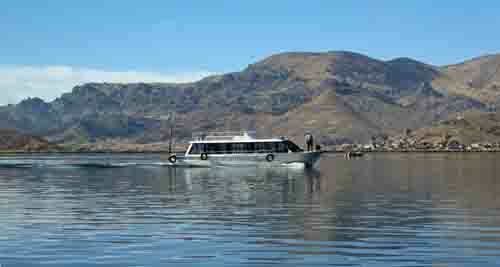 Lake Titicaca is 165 kilometres long and 65 kilometres wide at its widest point. At an altitude of 3,812 metres (just over 12,500 feet) it is said to be the world’s highest navigable lake. “Titi” comes from the word used to describe the mountain tiger cat or puma. The lake is said to have the shape of a puma. “Caca” means stone. The local humourists insist that the titi is for Peru and the caca is for Bolivia who shares the lake with them. Just before heading to the docks our guide David took us to a local market area where we could buy some gifts for our island hosts tonight. Rather than give them money, the custom is to bring them something they can use in the way of a gift. We carefully selected bags of rice, pasta and fruit then bought some books and pencils for the children. The boats used to get us to the island were incredibly comfortable. This was going to prove to be very helpful as we found these boats did not move any too quickly. As has been the case with a lot of things, the boats had been altered and renovated to suit a purpose they were not originally intended to fulfill. They had large panoramic windows for excellent views but the seats were obviously not original equipment. They were high backed seats like you would see on a luxury bus. The back of the boat was an open deck and the roof had a bit of a rail around it so you could climb up there to get a bird’s eye view of the journey. Amantani is a small island with a population close to 4,000. There are two mountain peaks, Pachatata (Father Earth) and Pachamama (Mother Earth) with ancient Inca and Tiwanaku ruins on top of each. The hills are terraced and planted with wheat, quinoa, potatoes and other vegetables for use on the island. All of our island hosts were at the dock to greet us. Dressed smartly in predominantly black clothing you would swear they were in costume, which in a way they were. They were all attired in their celebration finery. They were there to lead us to our guest house in the Villa Orinojon community. It was only about half a kilometer away but was accessed through a confusing maze of stone walkways and walled passages – not likely something we could have navigated easily on our own. Our host Bonita, a short woman representative of all the women on the island, was tiny in stature but you just knew that if you stepped out of line she’d give you a proper dusting. She owned a small guest house where we were staying and lived there with her husband, her parents and her children. It was a beautiful family unit and everyone seemed to be involved. They were all appreciative of our gifts, especially the children. They were not only putting us up but were feeding us lunch and dinner today and breakfast tomorrow morning. The meals, which were primarily vegetarian in nature, were delicious but far too much food. I wasn’t feeling 100% to begin with so the soup and main course was a combo that could easily have been served one or the other. The portions were immense and the food was wonderful – although rice, potatoes and a pasty tuber all in one meal was a little over the top. Unfortunately the island people didn’t think of us as the lazy tourists we were and didn’t seem to realize that we had not been toiling in the fields all day. I hope they were not offended and think we were ungrateful – as a matter of fact that is exactly the message we asked David to relay to them. After lunch it seemed that living and trying to function at 13,000 feet was not sufficient, so for the sheer entertainment value of the exercise we took a 6 kilometre round trip hike up another 1,000 feet in altitude. The walk from the house to the village was inspiring because that is where we ran into a lot of the children and were able to pass on our gifts to them. My only regret is that we did not bring more for them. 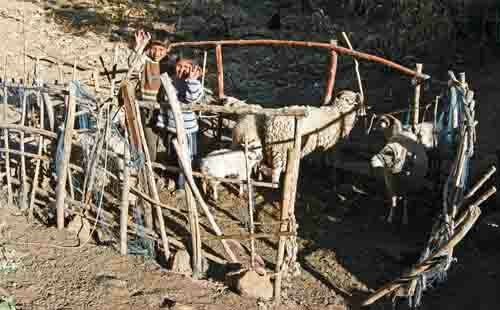 We passed through the village as we headed toward Pachatata. Today happened to be the anniversary of the neighbouring Isle of Taquile, cause for celebration here, and we were right in the middle of it. It was very obvious that this was not something that had been staged for tourists, if for no other reason than the majority of the audience were all islanders, staring at us and wondering if we were going to make it to the top. 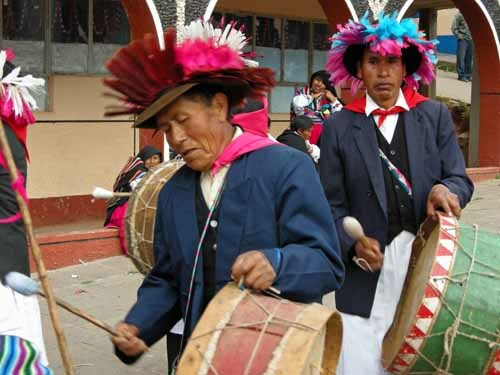 Adourned in colourful costumes, the villagers danced and sang in the village square. Once again we were blessed with an unexpected benefit of travel. 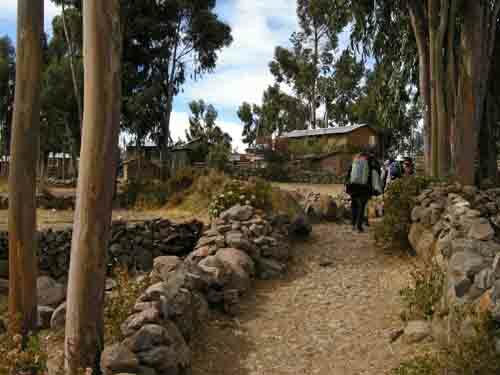 Upon leaving the village the path got much steeper very quickly. It was one of those deceitful excursions where it started out not too bad but soon became a hell of a lot of work. Karen seemed to be handling it a little easier than I was but then she was probably feeling a little better than I was to start with – ah, who am I kidding? Maybe she is in better shape than me. Pachatata is the lower of the two peaks on the island though from where I stood it seemed that it was only by a few feet. I’m sure it was a lot more than that but it’s amazing how your perspective changes as you find yourself gasping for every breath you take. It was a tough climb but we were rewarded with a spectacular view when we arrived at the top. 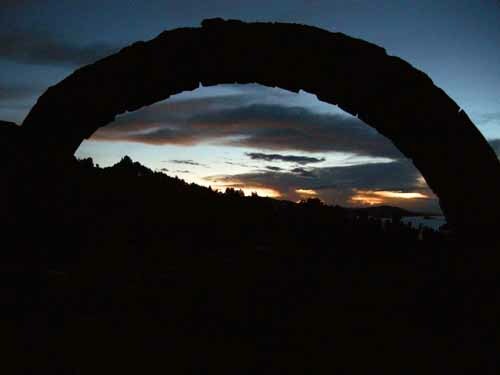 As we passed through stone archways I first noticed the ruins on top of the mountain. 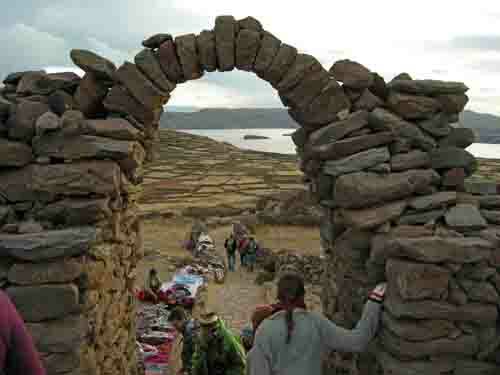 I then looked out over the immense Lake Titicaca and it all became a question of whether I was really there or not. It was that unbelievable. I quickly came back to my senses, numbed by the freezing temperature at the top of the mountain. David came prepared with some homemade altitude sickness remedies. For starters he just picked some mint from the side of the pathway and had us crush it by rolling it quickly in our hands then inhale the deep aroma. We were still huffing and puffing so he brought out the heavy artillery – mint soaked in alcohol for three years. Now you’re talking. We rubbed that concoction vigorously in our hands then buried our faces in it, deeply inhaling the mentholated vapours. I don’t know if it worked or not but we made it and, cautious steps aside, the trip down was easier and faster despite the punishment dealt to our knees. When we arrived in the village square the festival was still in full swing. There was lots of dancing and singing in the streets accompanied by pan flutes and drums, but the best part was the fiery finale. David excused himself for about half an hour asking if we would be alright alone. 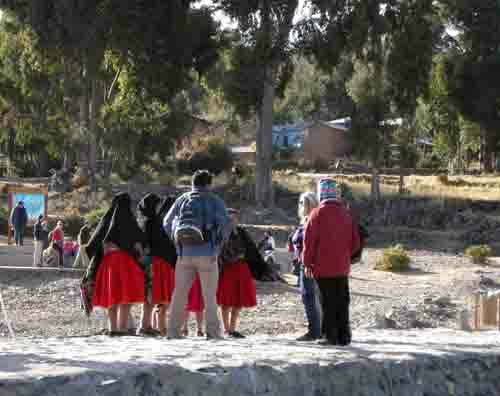 Are you kidding me; a native festival on an island in the middle of Lake Titicaca? Yes, I’m sure we can handle it! As he disappeared into the darkness several huge sheaves of straw were carried into the square. We looked at them and said, “No, they’re not going to set them on fire.” Karen commented that she didn’t think there was a fire truck nearby and I assured her that there was not likely so much as a bucket of water within reach. 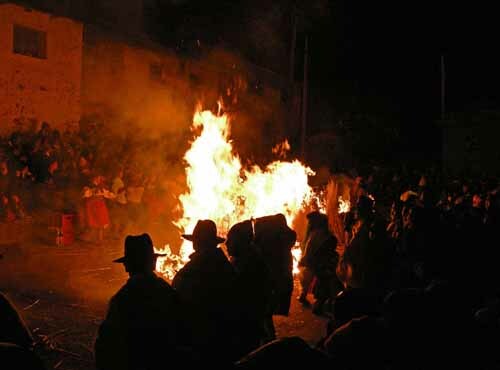 Sure enough four huge piles of straw were ignited and the village square became a raging inferno much to the delight of all the onlookers – ourselves included. I think the thing that I will remember the most about Amantani is that it was so incredibly quiet. At 6:30AM I could not hear a solitary sound. Silence is golden. There are no vehicles of any kind on the island, not even a bicycle. There are no dogs on the island and the people, I don’t know where they go, I don’t know what they do, they just kind of disappear and you never hear them again until the next day. I did not see or hear a thing from 8:30PM and on through the night. Too bad that did not translate into an award winning sleep. The beds had very thin mattresses and I could feel all the supporting bars in my back. I wasn’t cold though. There must have been 20 pounds of blankets on the bed and me. The silence and tranquility made it an unforgettable experience and I’m glad we did it because it was an option to do it that way. There was a chamber pot under my bed; boy did I ever feel special. I didn’t use it but it was comforting to know that it was there had there been an emergency. There was a modern bathroom on site near the exit to our building but there was just one small glitch. It was beautifully tiled but the toilet was not hooked up to any running water. You had to transfer water from a large drum using a small bucket and fill up the toilet tank. Oddly enough the water rapidly disappeared. I don’t know where it went because it was not on the floor, it was not in the tank and it was not in the bowl. Your only hope was to bail madly and flush fervently. Shortly after breakfast we said goodbye to our adopted Amantani family and headed down to the docks for our trip to the neighbouring Isle of Taquile. Bonita accompanied us to the water’s edge to bid us farewell. I still say she could take me down. There’s the chance to buy Eric’s very excellent travel book at his website and more by him on a brand new blog. Check them out.